Home WarZone NEO – Who will win control over Libya and its energy wealth? NEO – Who will win control over Libya and its energy wealth? [ Editor’s Note: The LNA shot down a GNA plane today, flying in from Misrata, so we have had our first plane shoot down, and an indication that the LNA had forces west of Tripoli with the Misrata militia base in its rear, an aggressive and dangerous position. We have had reports today of Tripoli forces abandoning immigrant detention facilities, as they were running out of food and water with no where to go. They are going to suffer the brunt of the current fighting via neglect. The strong ones are being shanghaied into the military as heavy laborers in exchange for food and cigarettes. Things are worse for the women and children. We also learned today that General Haftar’s move up from the south, after splitting the alliance between the two major tribes there, also brought the southern oilfields back online. 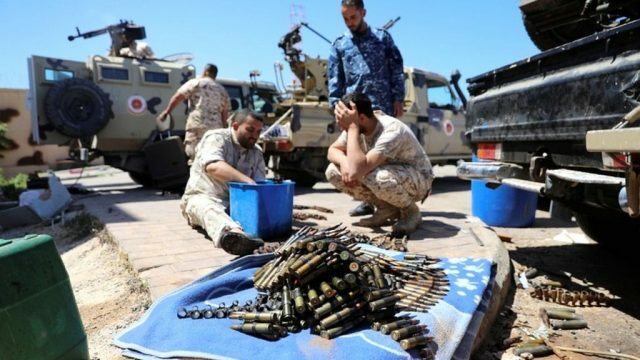 But a question remains as to who will get the money from it, as all export income goes into the Libyan national bank, unless Haftar has found a way to circumvent that. Somehow, missed for years now, the mainstream press has never reported that General Haftar is an American citizen, and that he had once lived in the US for many years. In his earlier career, when he had run into some serious trouble by being captured in the Libya-Chad war in Africa, a US organization eventually extracted and took him under its wing. 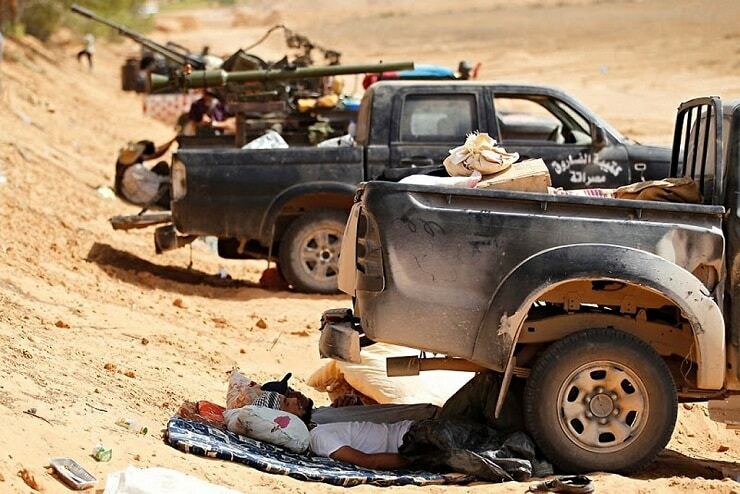 Some analysts feel that this relationship still exists, which might explain how Haftar has managed this two-front advance with mysterious supply lines. The sudden (but temporary) disappearance of US Forces leads me to believe General Haftar has never left the cold, damp embrace of the CIA, with the general intention being that Haftar is being granted a clean and clear run at asserting control over the entire of Libya, preferably without bloodshed, and without his being labelled a US lackey following which he will ensure some sort of deal with the (for now) internationally recognized Government based in Tripoli who, no doubt will have Washington whispering warm words of encouragement in their ears favoring such a deal. At that point, I have no doubt but that Washington, together with London, Paris and all of the other voracious rodents will fully expect to return to Tripoli and assert hegemony throughout North Africa but ……. I very strongly suspect General Haftar may have his own ideas on the role to be played by the western war-machine in North Africa post- his arrival in Tripoli: what I might describe as a slightly semi-detached relationship and to be kept at arms length pending his asserting full and absolute control over the entire of Libya’s Territory and it’s very considerable Oil & Gas wealth. Once this primary objective has been achieved, I believe Haftar will shut out his western puppet-masters and reassert Qaddafi’s and Libya’s previously-held role as Leader of Africa’s desire to carve out its own independent role in the world whilst retaining good and businesslike relationships with “the West”, whether through ensuring access to the Oil-fields, Mineral wealth or otherwise. Despite his US Citizenship, I believe he will NOT allow military/defense access to either America or to NATO with his being far more likely to engage in ensuring a warm relationship with Moscow. I may be entirely wrong but I believe his previous long experience with the CIA has granted him unique insight into the thinking of Langley and within the State Department and while American hegemonists may scream blue bloody murder off camera at being double-crossed by “one of their own” they will maintain a modicum of decorum for fear of Haftar’s spilling little platinum nuggets of information on both the overt and covert activities of the CIA and US War Machine throughout North Africa and the Middle East, stretching as far east as the Punjab, arising from his own “work” with the CIA throughout the past 25 years. 1) Military Security Forces are about to announce, that the Sudan’s Sudanese President Omar Hassan al-Bashir who was in power for (30 years) since 1989, is to step down. 2) Julian Assange of Wikileaks has left from Ecuador Embassy in London with Police. Good work, You VT elders — but that You shure recognize already each morning and evening whilst shaving if before a mirror, I feel confident of. Keep it up! The Wikipedia breakthrough is a sweaty. Thanks folks, but Gordon and I have a ton of time on the whole Libyan war saga. If you go here to the VT board and staff page and scroll down to the bottom “In Memorium” section you will find Mohamed Mo Nabbous, KIA Benghazi. He was an early video blogger who had captured a large audience quickly via on the street selfie reports, and very anti-Gaddafi. We told him that with his high profile that it was crazy to be doing video shoots out in the street, where he was just sniper bait. But he had the “young disease” of not listening to elders. He said I am here, you are there, so I know more about the danger, it’s OK. A few days later a sniper put a bullet through is head, and yes, while he was out in the street shooting. Thank you Jim for the article. I’m following this escalation with great interest. Is it interesting that the US govt is not saying much about this? Like I’m comparing this to Venezuela and the difference in rhetoric and comments coming from the white house from the conflict in Libya in comparison to the Venezuelan stand off is great. So maybe General Hafter might still be in the CIA’s paybook?